It all started a month ago. We had just sat down at one of our favorite (athentic) chinese restaurants and was in the middle of giving our order to the waitress. Hot and sour szechuan soup, ma po tofu, pea-tips in garlic sauce. "Oh, I'm sorry," she said to me in a hushed voice, "the pea-tips are not great today, wait until September when they are good and mature." Disappointment. Disappointed because those soft, leafy greens were the reason I cajoled my fiance to make the twenty minute trip to Richfield. On the drive home, we decided that in a month we would make a trip to the asian supermarket for some of those mature pea-tips. Taking the waitress' words to heart, last Sunday was the day we designated for the asian market. All month I had been looking forward to this day, which turned out to be a bleak and raining day. I was not fazed; that evening we were going to dine on crisp pea tips sauted with garlic and drizzled with a little olive oil. So you can only imagine my disappointment at the sparse vegetable selection that awaited us. (Sparse is putting it subtly.) The vegetable shelves were practically bare, the pea-tips leaving much to be desired. It took me a few moments to contain my disappointment and make the most of the circumstances. We were already there, why not take this opportunity to stock up on some other asian ingredients such as sauces and our favorite roasted, brown rice tea. We eventually left with bottles of ponzu, various teas and an assortment of mushrooms, the one vegetable that was fresh and plentiful that day. 1. 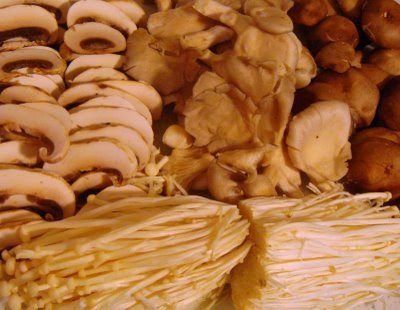 With a damp paper towel or tea cloth, clean mushrooms lightly to remove any dirt. 2. Toss with ponzu. 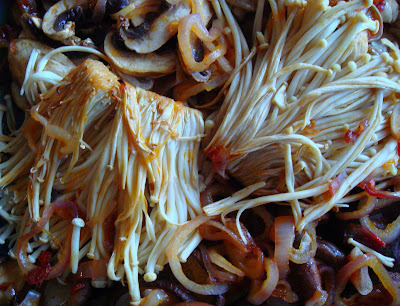 Evenly spread the mushrooms onto a baking sheet and broil in the middle of the oven for 5 minutes. Remove from oven and set aside. 3. Meanwhile in a hot skillet over medium heat, (it is important to heat the skillet before adding the oil) add the chilli oil and shallots. Cook shallots for 1 minute, without stirring, just long enough to infuse the oil with its flavor. 4. Pour hot oil and shallots over mushroom. Serve immediately. bummer about the pea shoots, but those mushrooms look fantastic!! I usually don't buy enoki mushrooms but the roasted ones look wonderful. I'm going to give it a try. Thanks guys!I'm glad that this post got you thinking about trying something new Maggie. Enjoy! but you still made something delicious! It sounds great, I was just searching for something creative for tonights side dish, thanks!